There is no evidence that I am being obsessive compulsive. That is correct. However, there is now proof positive that Eric Allen Bell is an obsessive, compulsive liar.He just lies about everything everywhere. He now has an international reputation for doing this. Imagine that, an "International Reputation". Here's a tip, if you're into year 6 of cyber-stalking someone: Flatter them. Attribute grandiose titles to them, such as an "International Reputation". If you don't flatter your mark, they might lose interest and stop responding. And that would be unbearable. You don't want to go back to lighting all those fires and cutting yourself again. Get some help, Crazy Larry. Go show a Psychiatrist the massive volume of content you have created and posted online about me. I'm sure they can diagnose you and get you onto the right medications. At this point, I do not believe anything Eric Allen Bell says. I don't believe he is married. I don't believe he has kids. I don't believe he was molested. It all might be true, but then again, he might be lying. On this forum alone, we have seen Eric Allen Bell maintain for weeks that the irregularities on his LInkedIn, and IMDb pages were inconsequential glitches caused by someone else, and that I was insane for bringing this up. But, we have also seen that after Bell Media of CANADA, LinkedIn, and IMDb were contacted about what Eric Allen Bell was doing, it all got rectified overnight. Yes, they know about him now in Canada. They know about him in Israel. They are laughing at him in Germany. And, they know about him in America, too. Yes, he has an international reputation as a liar, and fraud. And, calling me "insane" is not the way forward. Brooke Goldstein is trying to get Youtube, Twitter, and Facebook to follow the Spanish laws regarding anti-semitic content online . This is a threat to free speech, according to Eric Allen Bell. Notice that he links to his article about Pamela Geller being a disloyal Jew! Then he starts talking about the Canaanites. Eric Allen Bell has never written about Holocaust denial. His first foray into the subject is to take a principled stand in favor of Holocaust denial on the grounds of free speech. But we have seen on this forum that he does not agree with free speech in principal. He wants this thread taken down, and has threatened legal action. He did not want to discuss the bounty, his treatment of Clark Banner, his fraudulent LinkedIn page, etc. He wanted that all shutdown. Now he is a defender of free speech concerning Holocaust denial? You can't warn people about Eric Allen Bell, they have to see it for themselves. That is what I have been doing, preserving, and drawing attention to his incredible record of public statements. I do not share your views. Yes, I am critical of Israel, but I stand with Israel in fighting Islam. I’m very clear about that. I am a Nationalist but NOT a “White Nationalist” and welcome anyone and everyone who wants to fight to preserve and grow Western Civilization – and that includes Jews. Nazism has nothing for me. I am suspect of those whose loyalty is to a foreign country first (Israel) but I do not paint all Jews with the same brush. Islam presents an existential threat to all civilized people. And I will fight alongside those whom I disagree with on other issues, to destroy Islam. Nuclear armed Muslims are the defining issue of our time, with Neo-Marxists being a close second. Edited 1 time(s). Last edit at 07/16/2018 09:17PM by Eric Allen Bell. Title: "Jewish Organization Demands Internet Censorship or Face Legal Action"
The self-described “legal arm of the pro-Israel community” a Jewish lobby, has issued “cease and desist” legal threats against Google, Twitter, and Yahoo, demanding that they censor content critical of Jews or face legal action. This according to a press release issued by the New York-based Lawfare Project – which on its website claims to be the “Legal Arm of the Pro-Israel Community”. Well folks, I am very much in support of Israel. Israel is the first line of defense against fanatical Muslims, who are clearly the biggest threat to Western Civilization today, along with Cultural Marxism. So I am a part of the “Pro-Israel Community” big time. But, like I’m sure many who support Israel and/or the Jews, I find this legal action and double standard to be absolutely unacceptable. Edited 2 time(s). Last edit at 07/16/2018 09:26PM by Eric Allen Bell. If anything is still unclear, here is my article entitled, "David Duke Hates You, America!" Edited 1 time(s). Last edit at 07/16/2018 09:34PM by Eric Allen Bell. You knew he couldn't stay away. He has to shutdown this thread, and is not a supporter of free speech. One can look back on this thread and find Eric Allen Bell trying to get me fired for something he said that was anti-Semitic. Even by his own standards he makes over the top anti-Jewish statements. Eric Allen Bell is Alt-Right that is the group associated with Richard Spencer, a Nazi. This is not me “painting” him as anti-Jewish. This is his own supporters telling him to back off. Eric Allen Bell claims that Holocaust denial makes him “angry”. But, he has never written one word about the Holocaust. The link he provides to support his claim that Holocaust denial makes him angry makes no mention of the Holocaust, none. Eric Allen Bell accuses Brooke Goldstein of being a woman who thinks, “ . . . she belongs to chosen group that doesn’t have to follow the same rules as everyone else”. The link he provides to support this assertion is to his piece attacking Pamela Geller for being Jewish. 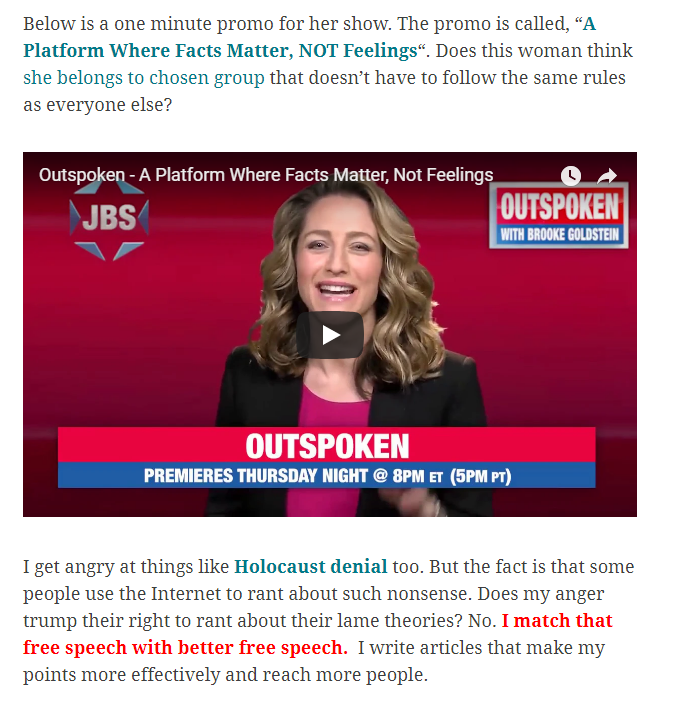 Brooke Goldstein is trying to get YouTube, Facebook, and Twitter to comport with pre-established Spanish law regarding Holocaust denial, and anti-Semitic materials. Eric Allen Bell makes no discussion of this. Instead, he brings up the Canaanites to imply Jews are a genocidal group. Eric Allen Bell’s article – “Jewish Organization Demands Internet Censorship or Face Legal Action” is not about freedom of speech. It is about Jews, and that he does not like them. This is his right, of course. He is free to dislike whoever he chooses. But to try to get us to believe this is not what he is doing is the act of a delusional cult leader. Edited 1 time(s). Last edit at 07/17/2018 05:41AM by livingengine.